Vietnam pays heeds to fortifying its relations with Rwanda, a potential partner of the country in East Africa, Deputy Prime Minister and Foreign Minister Pham Binh Minh stated on August 7. 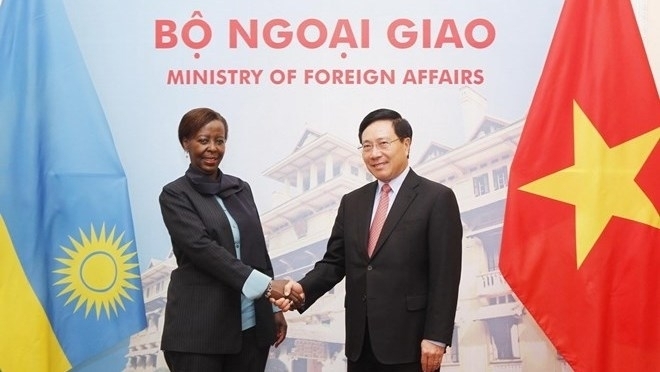 He made the statement at a meeting in Hanoi with Minister of Foreign Affairs and Cooperation Louise Mushikiwabo of the Republic of Rwanda, who is the first Rwandan senior official to visit Vietnam over the past 10 year. At the meeting, the two sides agreed on specific measures to deepen bilateral relations toward effectiveness across different spheres. In politics, both host and guest voiced their support to increasing exchanges of delegations at different levels of the countries’ Parties, Governments, parliaments, and authorities of localities. They said bilateral people-to-people diplomacy needs to be promoted to boost solidarity and mutual understanding. The host expressed his hope to welcome high-ranking Rwandan officials in the country. Among measures to push up bilateral trade, the officials agreed to step up liaison on policies and market, facilitate enterprises from both sides, and encourage trade promotion activities via forums, delegation exchanges, and exhibitions. They also exchanged measures to increase cooperation in agriculture, oil and gas, and defence-security. Louise Mushikiwabo said Rwanda is looking for Vietnam’s assistance in the fields of agriculture, mining, and telecommunication, noting that the country welcomes Vietnamese firms to study its market and set up partnerships. The two officials agreed to soon sign a series of legal documents, including agreements on trade, visa exemption for diplomatic and official passport holders, and on investment encouragement and protection. They also eyed a cooperation protocol between the two foreign ministries. These pacts aim at creating a favourable legal framework for bilateral ties. Both host and guest affirmed their commitments to enhancing mutual support and exchange at multilateral forums like the UN and the International Francophone Organization (OIF). Deputy PM Minh stated Vietnam is a key member of the Francophone community in Asia-Pacific, which has demonstrated its role and responsibilities in boosting the position of the community in the region.